The fraud and corruption case against former South African Revenue Service (SARS) official Mandisa Mokwena has again been shifted, this time to October 5. The case dates back to 2011. Ms Mokwena’s attorney, Johann Schafer, said on Monday that the National Prosecuting Authority (NPA) had asked for more time to decide whether to proceed with a corruption case against her. This was after she had made representations to the national director of public prosecutions on why the charges should be dropped. Parties agreed to the court being made available from October 5 but the NPA might, in the meantime, decide on the representations made by Ms Mokwena’s legal team on why the case against her should be dropped, Mr Schafer said. Ms Mokwena — who is now employed by the State Security Agency — and 10 others face 57 charges in terms of the Prevention of Organised Crime Act, ranging from corruption to money laundering and racketeering. According to the charge sheet, Ms Mokwena along with eight others formed an “enterprise”, and its primary purpose was to “enrich the members and associates thereof” by securing contracts from the SARS risk management division and its segmentation and research division. This was done through manipulating the tax agency’s procurement process. Ms Mokwena was the GM of the SARS risk management division and group executive of the SARS segmentation and research division at the time. It is alleged that Ms Mokwena corruptly received or agreed to receive “gratification” of about R977,000 “and/or information or assistance tantamount to an advantage to her doctoral studies which was not legally due”. This was allegedly in exchange for manipulating the SARS procurement process to provide the other accused with contracts. 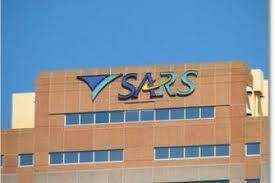 The matter was uncovered by SARS’s anticorruption unit, headed by Clifford Collings, who resigned from the tax agency during the shake-up of senior officials in recent months. Mr Collings quit last month after he faced a disciplinary hearing for failing to provide new commissioner Tom Moyane with a vehicle in time. Ms Mokwena left SARS after facing a disciplinary hearing late in 2009. She was arrested thereafter and the case has continued since. According to the Beeld newspaper, Ms Mokwena is a former business partner of one of President Jacob Zuma’s wives. Meanwhile, Mr Moyane will this week brief Parliament’s portfolio committee on finance on the events at SARS in recent months, including on the findings of the independent panel, headed by advocate Muzi Sikhakhane, into the conduct of former investigations head Johann Van Loggerenberg and which extended to the existence of a “covert” unit. Disciplinary processes against the tax agency’s deputy commissioner, Ivan Pillay, and strategic planning and risk head Peter Richer have yet to take place. This article first appeared on bdlive.co.za.